« Alton Brown — HELP! I should get up early more often! 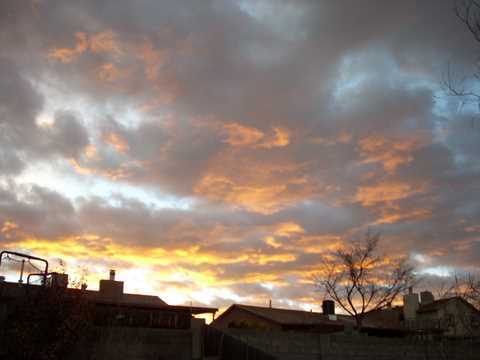 If only there was an alarm clock that could wake me on days with beautiful sunrises! Yesterday was our Slipped Stitches get together. We meet at a local cafe that has wonderful temptations. I had the breakfast casserole — black beans, turkey sausage, potato, and cheese. Again, I should have had my camera with me. Kathryn had made a cute neck warmer for her aunt. You can see a pic and get the pattern here. Kat’s is a beautiful royal purple, and when she finished that one, she immediatly started on a bright red one! No one is going to be cold in her family, that’s for sure. After knitting, we carpooled over to Quilt’s Ole for their 20 FQ/$25 sale. I focused my picks with the idea of making some placemats for DD. I really didn’t need 20, so Helen and I saved some shelf space by sharing a basket. At the checkout, there was a basket full of the cutest little jewelry bags made out of triangles. I was tempted to buy the pattern, but with a little encouragement from Helen, I came home and made one. Very easy and great fun. I’m going to make a bunch for gifts. Here’s a in progress pic. I need to find some pretty ribbon to make the pull strings, tack down the little tabs and it will be done. 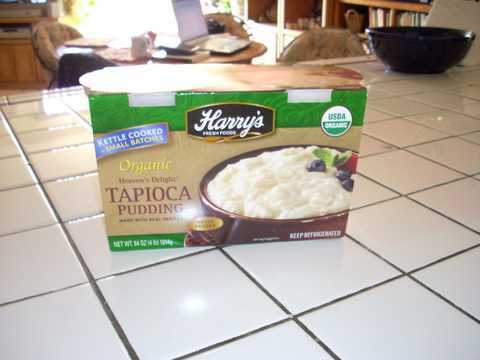 If you live near Costco and want a yummy snack, try this — it’s the best tapioca I’ve ever had. DH went by Costco this morning and brought me a treat. He told me I better refrigerate it and I told him it was going to get to “tummy temperature” right away! thank you so much for your message, today I feel much better! but it made me go and look at your wonderfully cheerful blog and it is now in my favorites. Thank you and I love your photos too, brings us so much closer. That is a beautiful sunrise! Tucker liked it also! Love the sunrise too! Please oh please share your pattern on the little bag…it’s looking great! You know where to find me :-).